Huge thanks to all who participated in our successful launch of Alien Shores. We managed not one but four launches for Alien Shores: Tales of Refugees and Asylum Seekers. Edited by Meenakshi Bharat and Sharon Rundle this volume features stories from Australia and the Indian subcontinent by Linda Jaivin, Arnold Zable, Amitav Ghosh, Susanne Gervay, Jamil Ahmad, Sophie Masson, Deepa Agarwal, Michelle Cahill, Joginder Paul, Ali Alizadeh, Tabish Khair, Abdul Karim Hekmat, Anu Kumar, Andrew Y M Kwong, Bijoya Sawian, Julia Mackay-Koelen, Sujata Sankranti, Sharon Rundle and Meenakshi Bharat; with a foreword by Rosie Scott. The collection of stories is a transnational publication to bring stories from India to Australia and from Australia to India. In our brief to the authors, Meenakshi and I asked that the stories be fictional, original and not play the blame game; but reveal the deeper complexities of the lives of refugees and asylum seekers from many different perspectives. The authors responded to our brief by imaginatively showing the effect on people in their daily lives. These diverse, creative and imaginative stories cover some surprising territory. Each story is different and unique. This means that we have included stories that portray refugees in a less kindly light, stories with no happy endings, stories that are deeply moving and stories that inspire with their courage and hope, warmth and humour. 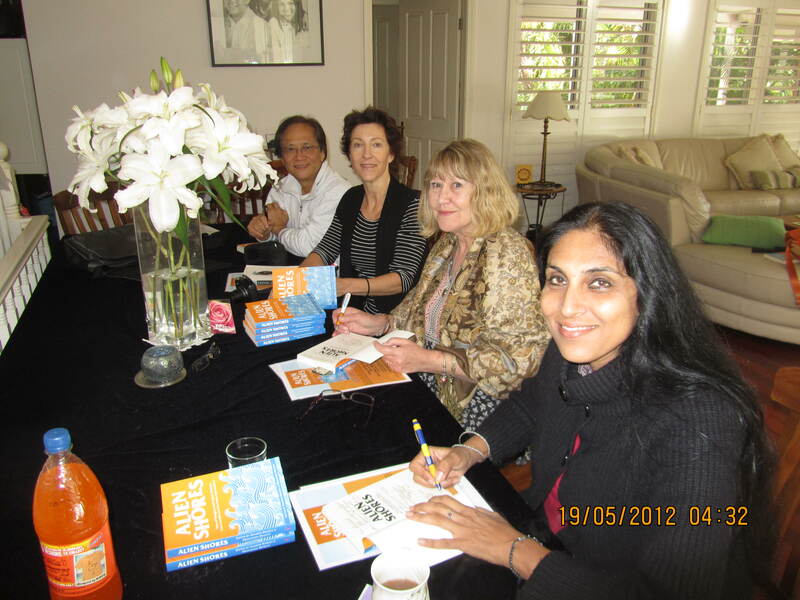 In Sydney, Alien Shores was launched on May 20 by Mr Amit Dasgupta, Consul-General of India, Sydney, at a stellar event sponsored by the Hughenden Hotel. Finding a person to launch a book is never a problem. The real achievement lies in having someone who has not only read the book but one who brings a unique understanding to it. In releasing Alien Shores, the Consul-General of India, Sydney, Mr Amit Dasgupta addressed the audience in a way that showed compassion and understanding. He acknowledged the gravity of a world with a moving mosaic of refugees. He spoke of the need for us to show humanity and of how easily any one of us could be thrust into similar situations. The Consul-General spoke with warmth, generosity and humour. Roanna Gonsalves, our MC, made sure that the launch was beautifully paced. Editors Meenakshi Bharat and Sharon Rundle spoke about discovering the theme and collaborating to bring these stories from Australia and the Indian subcontinent together in a transnational collection. Linda Jaivin, Andrew Y M Kwong, Abdul Hekmat, Michelle Cahill, Susanne Gervay and Rosie Scott, who have given such support for Alien Shores, came along and read from their stories; and afterwards happily signed books at our tea party. Authors in the audience included David Malouf, Devika Brendon, Patti Miller, Libby Sommer, Mabel Lee, Jacquie Everitt, as well as film and theatre producers Ana Tiwari, Neel Banerjee and Devaki Monani from SBS Hindi Radio. Readings Bookstore hosted the launch of Alien Shores in Melbourne on May 21. Julian Burnside QC gave a moving and eloquent speech to launch ‘Alien Shores’. Arnold Zable read briefly from his story in ‘The Dust of Life’, followed by author and poet Ali Alizadeh who spoke about the unique perspective of his story before treating the audience to a short reading from ‘The Ogre’. Sharon and Meenakshi revealed more about publishing the collection of stories. Publisher Kabita Dhara, spoke about Brass Monkey Books and Alien Shores. Authors Jen McVeity, Hazel Edwards, Meredith Costain, Paul Collins, Rose Inserra, illustrator Marjory Gardner joined us to celebrate the release of Alien shores. After toasting Alien Shores with a glass of bubbly, Meenakshi and I moved on to Lygon Street to a birthday dinner for Paul Collins with Susanne Gervay, Jen McVeity, Hazel Edwards, Meredith Costain, Rose Inserra, illustrator Marjory Gardner and Edwin Wandha where we consumed some delish pasta and a few more bubbles. Gosford Library Services held a Preview Launch on May 18 at their Erina Library on the NSW Central Coast. Guest of Honour, Deb O’Neill, Federal MP, gave an impassioned speech about the theme of the book. Her deep understanding and recognition of the purpose of the book and the individual stories within, as she launched the volume had the audience spellbound. Andrew Y M Kwong, Michelle Cahill, Julia Mackay-Koelen attended the launch. Editors Sharon Rundle and Meenakshi Bharat talked about the value of reading the stories by authors from India and Australia in Alien Shores. John Caska, acted as MC to introduce the guest speakers. Gloucester Writers’ Festival launched Alien Shores during their warm and friendly lunch time event. The festival featured writers Michael Wilding, Lisa Heidke, Lisa Walker and Susanne Gervay who was keynote speaker. Andrew Y M Kwong and Sharon Rundle read from their stories. Sharon spoke about the genesis of the book and Susanne gripped the audience with her story of her refugee background. 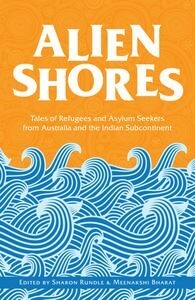 Alien Shorespresents nineteen remarkable stories from acclaimed writers based in Australia and the Indian Subcontinent, which ruminate on the lives of refugees and asylum seekers all over the world. Powerful, poignant and sometimes funny, they tell the tales of brave people who, at great peril to their own safety, seek out a new life in a new land. Alien Shores is available in all good book stores, including the Coop Bookshop, Berkelouw Paddington, Abbeys, Dymocks, Gleebooks, QBD. Alien Shores is published by Brass Monkey Books an imprint of Hunter Publishers.